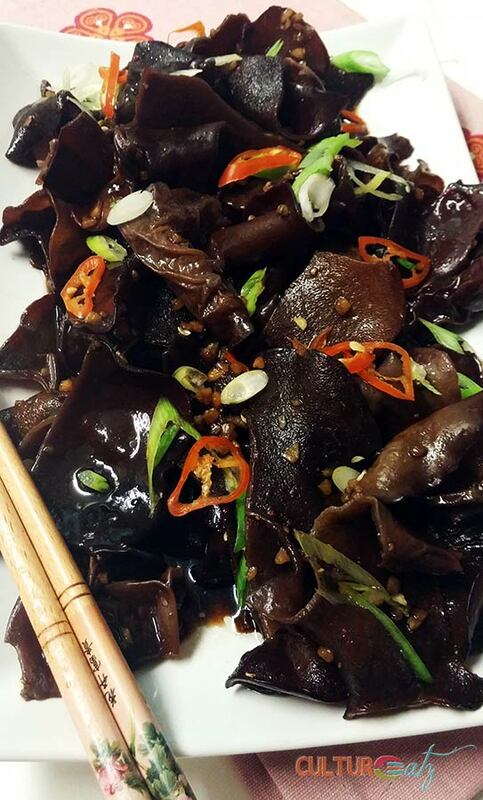 Don’t shy away from tasting this lovely Black Fungus Salad called Liángbàn Mù’ěr. This mushroom salad is slightly crunchy, refreshing, and perfectly paired with a spicy soy sauce and rice vinegar dressing. Beijing is like the Liángbàn Mù’ěr, or Black Fungus Salad. It looks scary and intimidating at first sight, but if you get over your fear and peel away the layers, you will be rewarded with enchanting and beautiful flavors. Right now everyone is asking me how my trip to Beijing China was. The problem is I cannot respond with a short answer. I just can’t. You better be ready to pull up a chair and listen to me go on for a few minutes. My mind could recognize that I was in a massive urban landscape, but everything else was different. Everything! The food, the social structure, the architecture, the acceptable social behavior, the scrutiny of security in various forms, being observed all the time as a foreigner, the gray clean beauty. I think only people who have been there will get that last part. 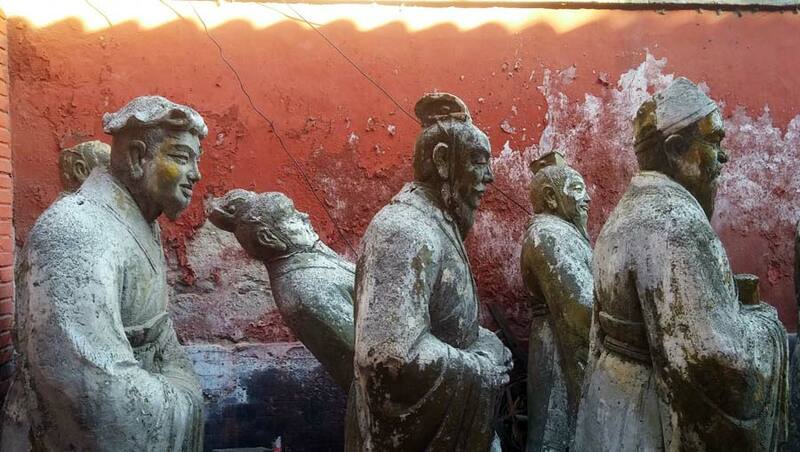 Beijing is the embodiment of a clash between the very old and the ultra new. All the last modern inventions battle with the still very present rigid communist conformity. The mystical blends constantly with state of the art science. Coming from a very individualistic Western society, my core was shaken as I was absorbed into the heard communal mentality. That is a really hard concept to grasp for us. Personal space is non-existent and what happens to you affects everybody. It is not as bad as you imagine but you see it and feel it. I will make a video discussing this topic more in depth but here is an example: I made 4 Chinese friends before I went on holiday and spent time with them in Beijing. When we walked down the street they did not walk side by side to me but rather pushed up right up against me. All 4 of them, man or woman, you literally walk together! One final thing I want to discuss: you will get stared at all the time. We foreigners are still a new thing and a novelty in China. Even in urban Beijing, many locals will look at you all the time because you look different. It is only curiosity and it is not intimidating at all. After a few days, I always made a point of making contact with people who started at me by staring back with a huge radiant smile, by waving or saying Nĭ hăo (hello). That always startled them but created lovely minute exchanges. And a few times I was approached by more provincial Chinese travelers with complete curiosity who asked if they could take a picture of me with them. I loved that! Give Beijing at least 2 weeks if you really want to see the city properly. It is a MASSIVE city. It takes a long time to get from point A to point B. Even the tourist sites are gigantic. Stick to the subway and walking. It is really easy to take the subway and everything is also in English. Wear excellent shoes. You will walk a lot, like a lot! Try as many weird street foods and snack foods as possible! It’s everywhere. Just make sure meats are well cooked and pick stands with a high turnaround so the food is fresh. Check out my Beijing Foodporn Diary here. Explore the various hutongs (I’ll tell you about them further) around the city as much as possible, get lost in them. It is amazing how much local life you will see here. Facebook, Twitter, and many other Western websites are blocked in China. You will need a Virtual Private Network (VPN) in order to access these sites (find out what is a VPN here!). Personally, I used ExpressVPN during my trip there and it worked great! Beijing is the best city for people watching I have ever experienced. Go to parks and the lakes and watch the Beijingers swim (in winter), play ping pong, dance, do Tai Chi and play cards or chess. 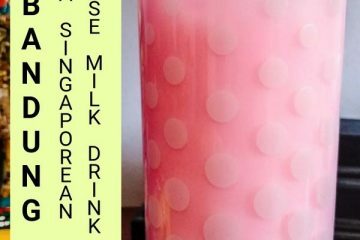 Most Chinese people do not speak English, like at all. But most people are super friendly, very warm and very generous, they will do their best to help you. You just have to break their ‘shy bubble’. 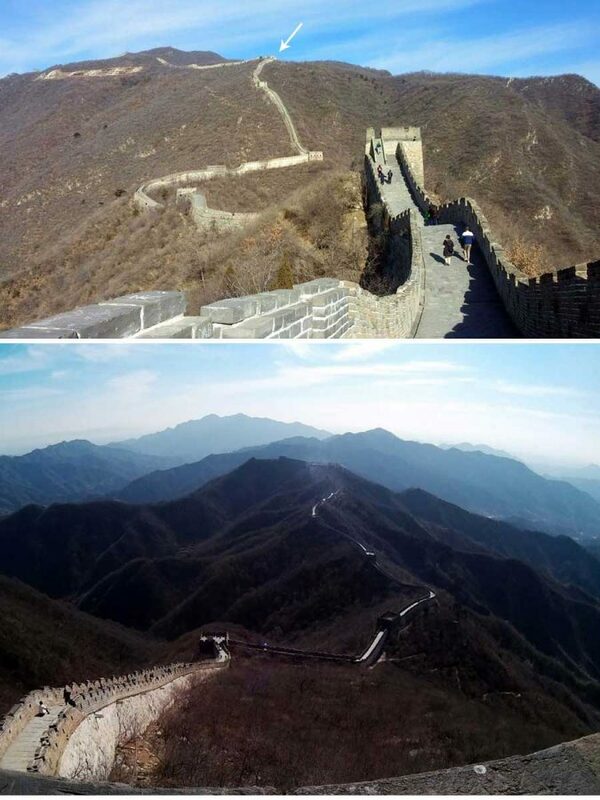 Depending on your fitness, see any section of the Great Wall other than crowded Badaling. I went to Mutianyu. Check out my growing 6 days in Beijing China YouTube Series. I am posting videos weekly with clips from my trip and lots of advice videos will be posted. The Yonghe Temple has been here since 1694. 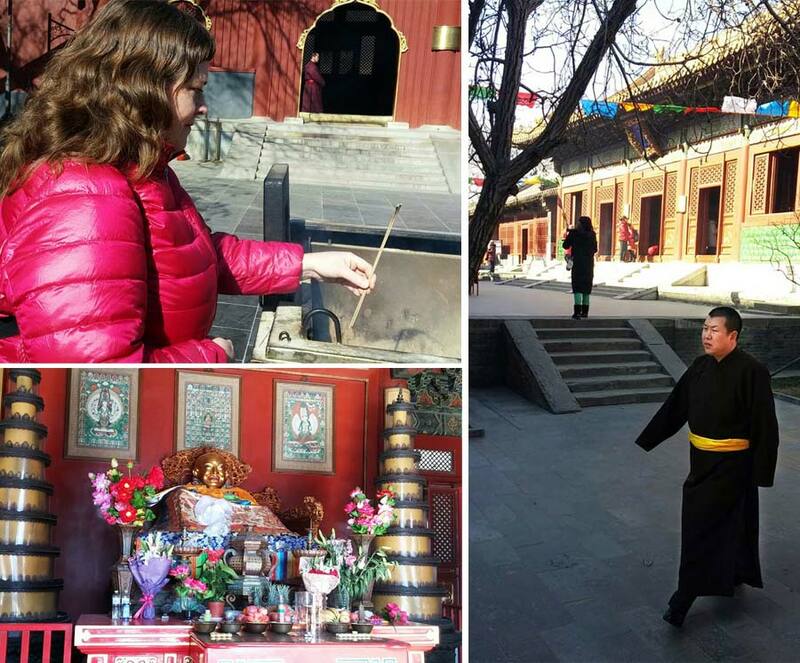 This Tibetan Buddhism temple is both a functioning temple and a tourist attraction. I loved the Buddhist temples best because you can see constantly people coming to pray. The temple gives out free incense so you can pay your respect at each building. The ongoing influence of Mao Zedong is still present, from his iconic portrait at one end of Tiananmen Square to the old men all over the city still adhering to the communist fashion. A taste of Beijing architecture! 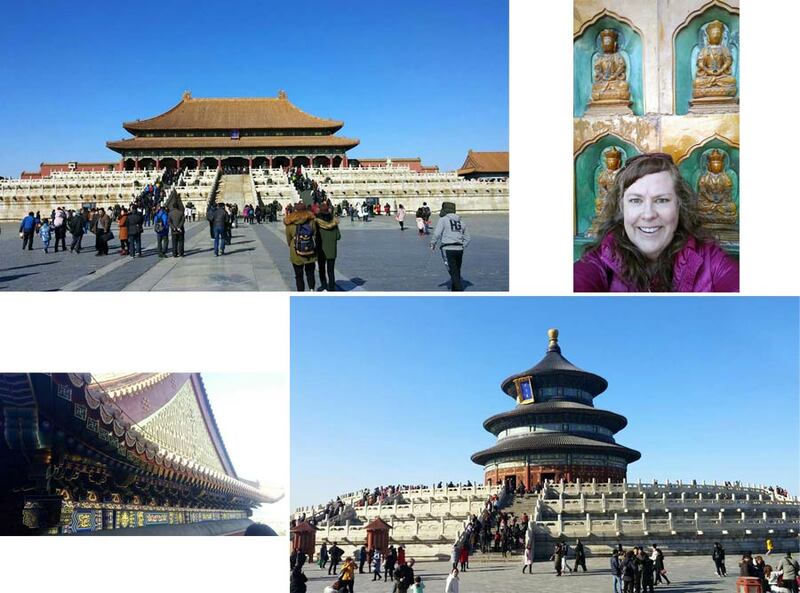 Top left: the Gate of Supreme Harmony in The Forbidden City. Top right: a wall close-up with me of The Temple of Buddhist Virtue at The Summer Palace. Bottom left: an example of the ornate woodwork involved in the roof structure of the Hall of Buddhist Tenets at The Summer Palace. Bottom right: the Hall of Prayer for Good Harvests in the Temple of Heaven Park. 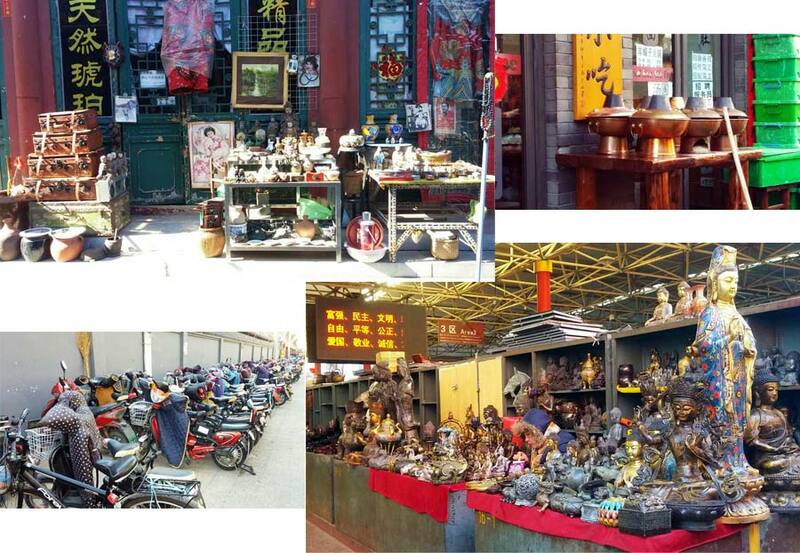 Top left and bottom right: scenes from the Panjiayuan Antique and Flea Market – I just posted here a video of my visit to the market! Bottom left: an example of mopped biking, they are everywhere! 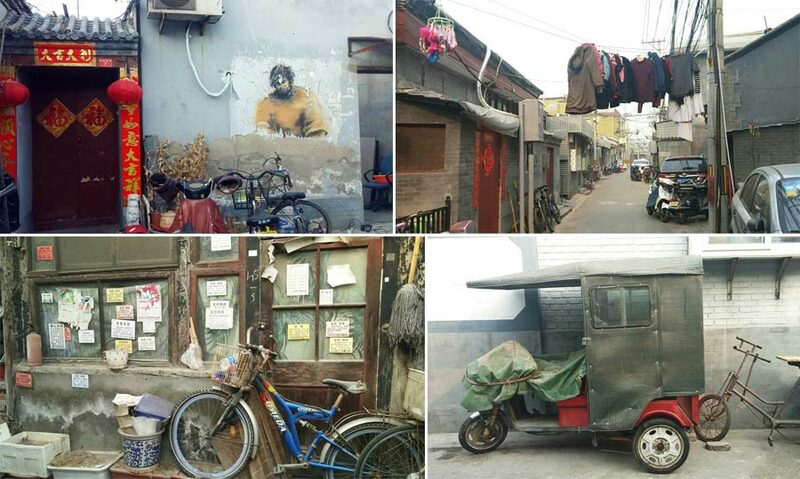 Four varied scenes from residential hutongs called The Eight Hutongs. Hutongs are alleys formed by lines of traditional courtyard residences. Each entrance leads down a labyrinth-like corridor where 4 to 9 families can live. This is the real China, the old Beijing untouched where you can see daily life. One of my favorite pictures of the entire trip, these guys were out of commission hidden in a dead-end corridor at the Temple of Confucius. They were not on display, there was about 30 of them just placed in storage facing a wall. We were not supposed to be there and take pictures technically. Top: a stunning winter scene at the Zhichun Perceiving the Spring Pavilion at the Summer Palace. Bottom left: men fishing in the Houhai, the largest of the three lakes in the city. Bottom right: view of the Wànshòu Shān (Longevity Hill) from the Zhichun Pavilion at the Summer Palace. A few fun random pics! Right: these two came up to me and asked to take a picture of me with them, small town Chinese tourist are very curious about foreigners!!! More hutong life and scenes. Oh yeah, did I mention there is no plumbing in the hutongs and everyone goes to these public bathrooms? Except for hotels and modern buildings, you will find squat toilets like these. 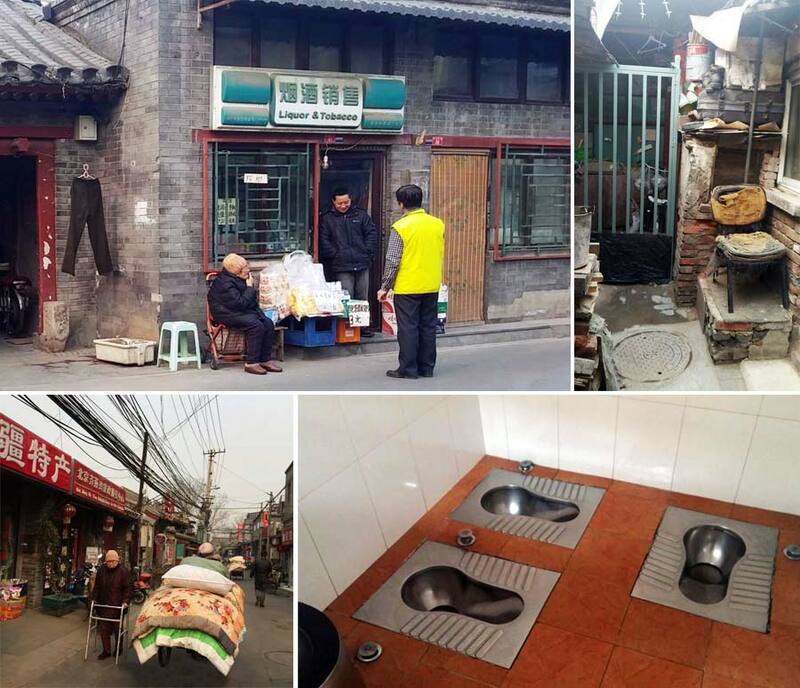 In the hutongs, there is zero privacy as there is no stall separation. It’s all part of the no personal space attitude you find there. No trip to Beijing is complete without a day trip to the Great Wall of China. I went to the Mutianyu section. It is restored but not as crowded as closer sections to Beijing. I was there at the best time: low season so no crowds. I hiked from tower 14 to 20 (see arrow in top pic!). And finally, I just love the outside facade of the restaurant where we went for Pekin Duck. I have no idea what the name was but I can tell you the address is 17 Meishi Street by Qianmen. Pass the Black Fungus Salad, please! One food item on my bucket list to try in China was the black fungus (Mù’ěr), an edible jelly fungus that grows on trees in mountainous regions. Don’t freak about because of the word fungus. A fungus is a mushroom!!!! Seen in the photo above the Liángbàn Mù’ěr dish, or Black Fungus Salad, we had that night. 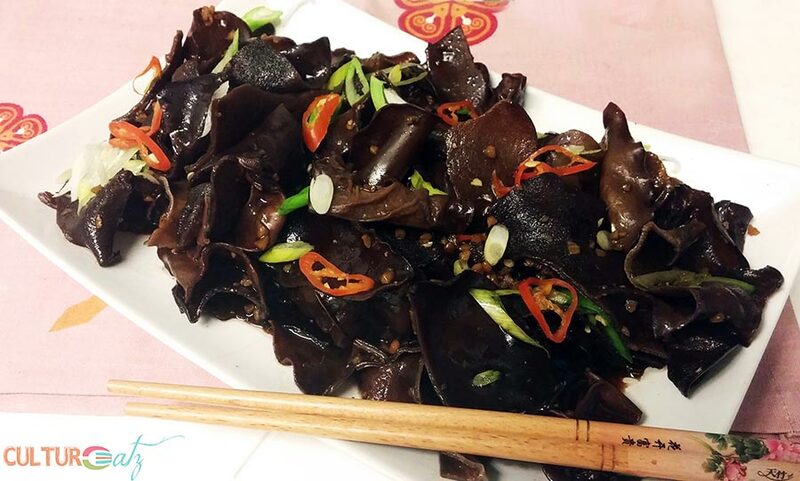 This Black Fungus Salad was on the top of my list as well of the recipes to try when I got back home. Just about any Asian grocery store will have dried black fungus in stock. It could also be listed under the names wood ear or cloud ear fungus. For the Black Fungus Salad the smaller the fungus the better. To hydrate just place them in a big bowl of water and leave for a while. They will absorb a lot, and I mean a lot, of water and get a whole lot bigger. The fungus is more or less tasteless but has a great slightly crunchy texture. They are delicious served with rice vinegar and soy sauce with a little bit of a spicy kick. Time to take out your Sichuan peppers if you got em’! Place the black fungus in a big bowl and fill with about 5-6 cups of very hot tap water. Leave for 20 to 30 minutes, or until the mushrooms are rehydrated. Drain the mushrooms and cut off the hard stem part. Tear or cut the mushrooms into bite-sized pieces. Bring water to a boil in a big saucepan. Add the mushrooms and boil gently for 3 minutes. Drain the mushrooms and set aside to cool. In a bowl mix the garlic, soy sauce, rice vinegar, sugar, salt, oil and Sichuan pepper. Toss the mushrooms with the sauce, and slice Thai chili if using. Place in a serving dish and top with spring oinions. Next ArticleAshe Anar | Pomegranate Soup & it all started 10 Years ago TODAY! I still haven't found the asian shop to stock the foods I like, but will add to my list the ingredients for this salad. Sounds like it packs a pretty hefty health benefit punch, something I could def do with. Love that you recommend trying as many weird and wonderful street foods as possible, eating main stream when you travel often means you miss out on some pretty fantastic feeds. Looks like your adventures were incredible gurl. Yeah I have not really gone hunting for more specific items in Asian shops yet but I have a great one nearby, so far been lucky. Highly recommend the salad, god and a bit unusual to eat lol. So agree with trying all kinds of foods! Wow. We are in Japan at the moment and my two little red heads are a big novelty. I'm not sure how they'd handle China! At least in Japan, even though it's crowded, they seem to move like fish and never actually touch you - unless your squashed like sardines on the train! Oh that is so cool that you are in Japan! One day I will go. Yes red heads would stand out lol. Well they look but with curiosity, it is not mean stares. I kind of missed being stared at when I got home. Yeah the touching though, it's gonna happen in China but again no negative vibe. Loved the post! A lovely virtual trip and a delicious salad. I've been noticing black fungus in a local Asian store from a long time and wondering how people eat it. This would be a great recipe to start with...packed with flavour! Thanks glad you liked the post! Oh so cool you have noticed these black fungus, I hope you will give it a try. 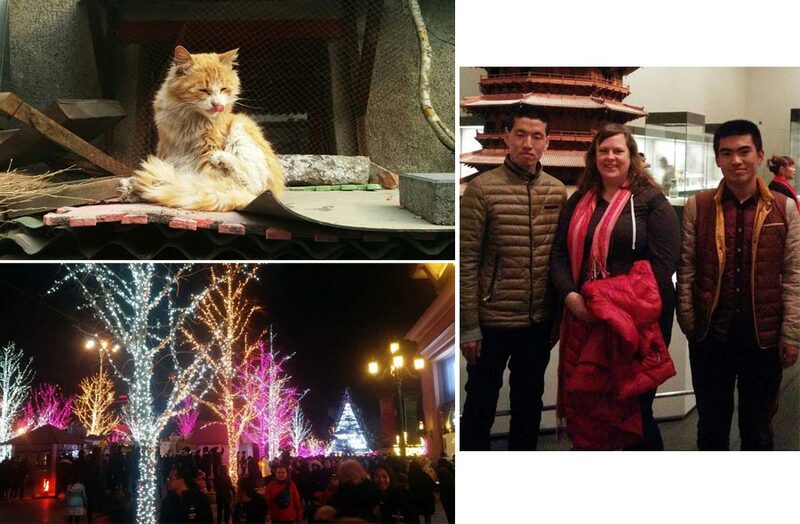 Thoroughly enjoying your posts on your experiences in Beijing. Those little like "walking together" experiences is something you don't see in travel books and a very weird behavior IMO. :) Lots of interesting places you're going, things you're experiences and food you're eating. This salad is something that I would embrace as well. I love weird and this is definitely weird but sounds delicious! Ah thank you MJ! Ha ha that “walking together” experience was like the least weird 'no personal space' example, but it was not so bad overall, just very different. HELL NO I love freaking people out :-D Please put your reply notification plugin back on for the new site **bats eyelashes**? Wait, what does that mean?? hahahahaha! I get notified when you comment....? I meant on your site, I used to get notified when you answered my comments on your site, but not since the new theme. Great looking salad. And great looking pictures! It sounds like you had a wonderful time. And gave us some great tips, so we'll know what to expect if we're lucky enough to go to Beijing! Thanks so much. If they are tasteless, do people just eat them for the health benefits or something? What are the health benefits? Excellent question Jennifer. Well they do have a fun texture when eating, that is for sure. And thye do have a lot of health benefits, like as an anticoagulant, reduce high blood pressure and cholesterol, can prevent coronary heart disease and arteriosclerosis, and antibacterial. This article brings back memories of my trip to China seven years ago. I had almost forgotten how wonderful and varied the mushrooms are in China - a good surprise in a trip filled with surprises. Oh nice Mindi you ave been to China too! Veyr well said suprises within surpises, I hoep to go back very soon. Thanks Sahar and it taste great too. Well for the toilets they are used to it, and I did not need to use one of those lol. Thanks Juliana glad you liked the salad...and know it! And so gad you liked the pics! Have agreat week too! LOVE your trip review! Going to China is on my bucket list, but the hubby has no interest! He's worried he would starve, LOL. What a fun adventure. Thank you so much Liz! Bill could survive on sugar and carbs easy with all the sweet snack stands. I hope to go back in the next 12 months. Lovely photos Eve! :D And good for you making this salad. I've only eaten it but never made it before. One day I will visit the Great Wall! Thank you Lorraine and it really is a delicious salad! So glad the Sichuan peppers there. Love your photos, especially the flea market ones. My nephew when to China last summer and I have yet to see ALL of the thousands of photos he took with his group. You made these fungi look appetizing!!! I love the flea market, it was so great to explore. Ha ha I only made you look at 30 pics, phew. I would not venture around without a guide and certainly not into areas one should not be in. Nor would I cope with the ablution facilities. However I would love to see The Great Wall. I love to go to places like this. 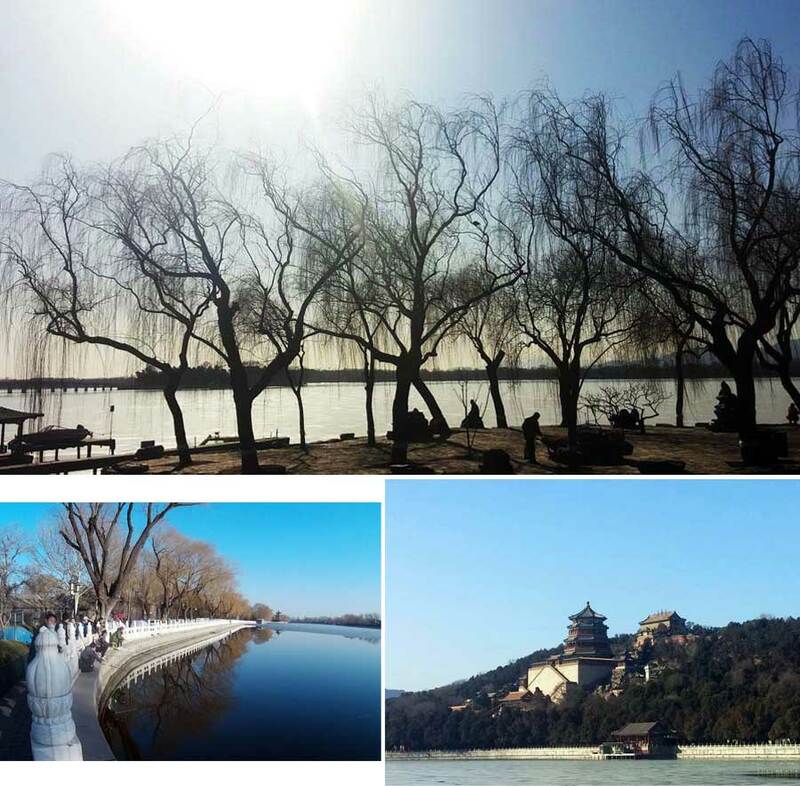 In Beijing you really do not need a guide, it is like any big city. By myself I had no problems going around. And I did not need to use the public bathrooms...just sneaked in for a pic :- They are more meant for the residents. OMG I had no idea you had been to Beijing so many times Angie, wow. You have to go to the Great wall next time ? ! I actually added the black fungus to a regular spaghetti sauce, was great!